The Withings Body Cardio smart scale adds crucial cardiovascular insights to your health data mix. This post is brought to you by Withings, maker of the Body Cardio smart scale. One of the great promises of the mobile and wearables revolution was that we’d all get unprecedented insights into our personal health. Apple even built a Health app into its mobile operating system. And what icon did Apple choose for its trailblazing Health app? An unmistakable red heart. Now a heart-healthy smart scale can capture critical data about your cardiovascular health that can provide a fresh perspective on your wellness regimen. With all the footsteps, calories and other metrics being collected by the galaxy of health apps, what’s missing is a real sense of progress (or lack thereof) where it counts — our actual bodies. The Withings Body Cardio, a new Wi-Fi-enabled bathroom scale, helps bring your body back into the picture by adding a new dimension to all that biometric data. One of the thinnest scales ever made, the Body Cardio leaves no question that it’s a product of the smartphone generation. The smart scale automatically syncs with data gathered from Withings’ free Health Mate iOS app (which is also available for Android phones). While you stand on the Body Cardio, you’ll see information and your personal progress in typical categories like weight, fat, mass, muscle mass, water and bone mass. In addition to body composition, you’ll also get a comprehensive heart health assessment. The Body Cardio captures key cardiovascular health metrics and provides insights that other smart scales can’t. The Withings Body Cardio records standing heart rate as well as pulse wave velocity, a measurement of arterial stiffness that has been called “one of the most important clinical parameters” for evaluating the risk of cardiovascular disease and measuring progress of medical treatment. What’s earning the Body Cardio such high marks? Its meaningful additions to the health-tracking process. Regular use of the Body Cardio adds the key element of body weight to your fitness data. With this advanced smart scale, weight becomes the basis for building a more trustworthy coach, record and reward system for meeting workout and weight-loss goals. A very helpful trend-monitoring feature creates an easy-to-grasp graph of your last eight days of progress, which makes a surprising difference when it comes to keeping motivated (especially when you have an off day). The Withings Health Mate app doesn’t preclude the use of your tried-and-true health apps, either: It syncs with around 100 other apps by a variety of developers. The automatic syncing and trend tracking helps you make sense of all the data collected by your iPhone’s health apps. All your personal data gets collected and contextualized, then presented right at your fingertips (or toes, as the case may be), leaving you to decide where to focus your efforts. The Withings hardware and software is thoughtfully designed to put information in front of you while staying out of your way. The whole family can get on board using the Body Cardio smart scale. It supports up to eight users, who will be recognized automatically, and each can benefit from a personalized Health Mate profile. The Withings Body Cardio smart scale will even tell you the local weather forecast to make sure you don’t plan a workout that leaves you drenched in more than just sweat. Raw data aside, the best thing any technological tool can offer with regard to health is perspective. Health apps give us a revolutionary picture of the state and direction of our health, but stepping on a scale adds an extra dimension — and a more robust way of staying informed in your quest for fitness. Adding key cardiovascular health insights makes you that much more on point. 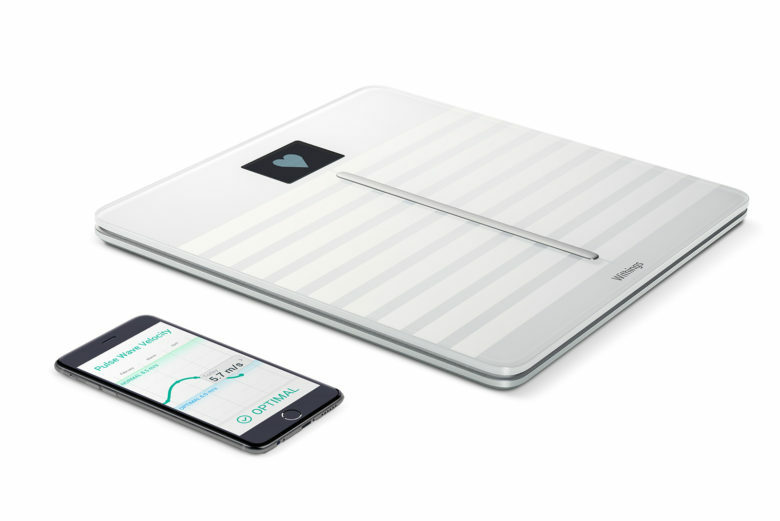 Get the hard facts about your body and your heart health with Withings’ Body Cardio smart scale. Then use that data, and your newfound perspective, to take control of your health and fitness. The Withings Body Cardio smart scale is available from Withings.com and Apple.com.